Manipal, Mar 6, 2016: With the objective of encouraging students to use more bicycles, the Manipal Institute of Technology has started a Bike Farm at D-22 at the campus. The Bike Farm was inaugurated by SP K Annamalai on March 5, Saturday. In his address, the SP commended the initiative which promotes bicycling among students and also has a service centre as part of the initiative. GK Prabhu, Director who also spoke, explained how a similar initiative made in 2005 had met with failure due to the absence of a service centre. To encourage students, he himself has purchased a bicycle for Rs 13,000. He said though bicycles will not be provided free of cost, the amenities provided at the Farm would encourage students and faculty to take up cycling. Col. C M S Kalakoti, Chief Warden. Alan Lewis, partner of the Bike Farm, Shane Machado, Managing Partner and others were present on the occasion. 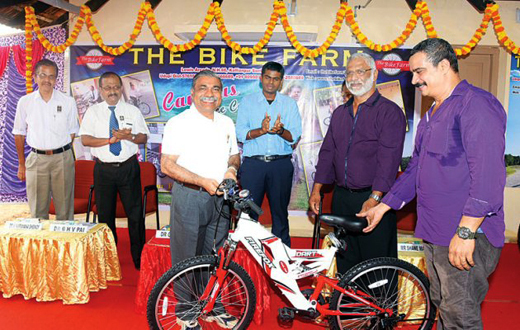 Venkatramana Sampath, a former teacher who goes cycling for at least 5 kms per day even at the age of 87 was felicitated on the occasion.